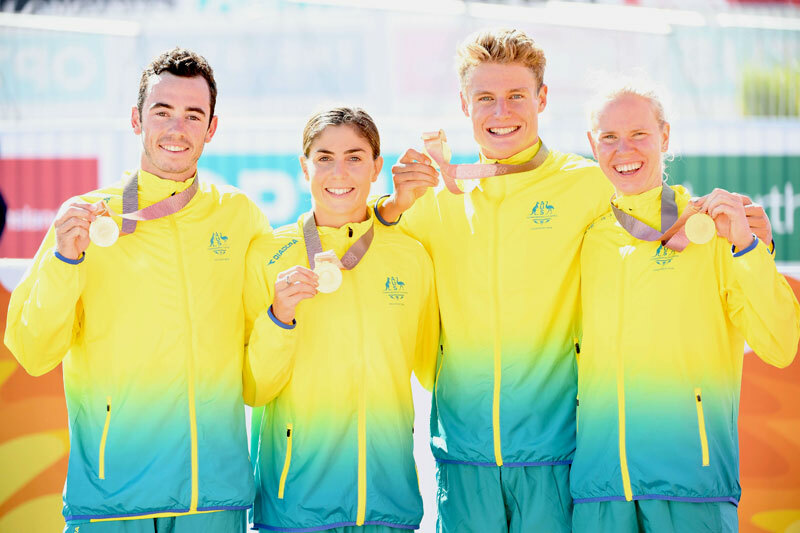 GOLD COAST, AUSTRALIA – With a near flawless performance, Australia grabbed the gold medal in the 2018 Gold Coast Triathlon Mixed Relay. Gillian Backhouse, Matthew Hauser, Ashleigh Gentle and Jacob Birthwhistle added the Commonwealth Games crown to last year’s world championship title, with Team England finishing in second, and New Zealand grabbing the bronze medal. Team Australia made only one change from the world championship winning team last year, with Backhouse replacing Charlotte McShane, and the Glasgow 2014 bronze medallists proved too strong for second placed England, who were defending their Glasgow 2014 title. The first leg was the one who settled the pace in the hot and sunny afternoon at the Southport Broadwater Parklands on Saturday 7 April. Backhouse and Vicky Holland (ENG) opened up a bridge that proved to be decisive, and they both raced together during the bike and the run segments of their leg. In a furious sprint, both athletes tagged Matt Hauser and Jonny Brownlee with only a five secons difference. Behind them, the young kiwi Nicole Van der Kaay rode with Non Stanford (WAL) and Joanna Brown (CAN) in a small group that kept pushing hard to try to keep up with the leaders. To everyone’s surprise, the South African team was pushed to the last position when Simone Ackermann had cramps that left her three and a half minutes behind the rest of the teams. It was then for the South Africans a matter of trying to catch up a bit, which they did, even though they still finished in the last place, despite Henri Schoeman, Gillian Sanders and Richard Murray’s efforts. With Hauser managing to keep up with the younger Brownlee, it was the third leg the one which swung gold in the host nation’s favour. Jessica Learmonth (ENG) came out of the water 15 seconds ahead of Ashleigh Gentle but, after the Australian closed the gap on the bike, a stumble from Learmonth entering the bike-run transition gave Gentle the gap she needed to power away on the run. She then handed over to Birthwhistle with a 39 second lead over Alistair Brownlee, and the 23-year-old Tasmanian eventually stretched the lead to 52 seconds. Alistair Brownlee tried to follow him and close the gap, but the efforts of the Aussie paid off, with the home team crossing the finish line first followed by the English. In the battle for the third place, Ryan Sissons did one of the fastest transitions ever to scape in the lead, and gave her teammate Andrea Hewitt a bit of a margin over Canada. Hewitt was then chased by Desirae Ridenour on the bike leg, but came back in the run with a seven seconds lead over the Canadians, the same seconds that the last team member, Taylor Reid, managed to maintain until he crossed the finish line in third place. The remaining positions were filled by Canada, Bermuda -with Flora Duffy catching up two positions during her segment-, Wales, Scotland and South Africa. “I gave it everything. I tried to help Matt be as close to Jonny as possible. I’m so thrilled I didn’t let the team down” said Backhouse after her leg. “I can’t thank the Gold Coast and Australia enough for the amazing support, getting behind us all the way, is unbelievable”, said a proud Gentle with the gold medal shinning in her chest. “It was honestly the biggest relief when I saw Jake crossing the finish line. It was absolutely nerve-wracking watching the last leg, anything could have happened at the end there”, she explained. And just like nine months ago in Hamburg Birthwhistle had the honour of crossing the finish line in first place, in a combined time of 1:17.36The last leg for the Aussies was for Jake Birthwhistle, whi literally gave it all to keep Alistair Brownlee behind. “That last leg could have gone either way. Going into it I was just thinking I’ll try to keep up as much as possible with Alistair in the cycle then I’ll take him in the run, but I had a decent lead. I definitely didn’t relax. I wasn’t going easy but the lead was more than I expected going into the run, so I was quietly confident coming into the end”, he explained. “I thought even if I got it together it would be close. We talked through every combination last night, and we knew it would be with Australia but we didn’t pick this”, said Alistair Brownlee after the race. His brother Jonny added: “Obviously we would have preferred gold but we all did the best we could, and we were beaten by the better team at the end of the day”. Extremely proud of the team performance was Kiwi Andrea Hewitt: “It’s so much better to win a medal with a team. I just want to thank everyone and all of our supporters. I’m so proud of this team”. “It’s scary standing on the sideline and watching your teammates compete. We all did so well though. From the start, I knew we had a chance in the game and I had full faith in my team. They just set it up so well from the start”, said Sissons.